Mish's Global Economic Trend Analysis: Discussion of Target2 and the ELA (Emergency Liquidity Assistance) program; Reader From Europe Asks "Can You Please Explain Target2?" Discussion of Target2 and the ELA (Emergency Liquidity Assistance) program; Reader From Europe Asks "Can You Please Explain Target2?" I am a daily reader of your blog. I live in the Netherlands. Recently I saw an overview of target2 balances, including charts. If a Greek depositor sends money to a foreign bank (say a German bank), that bank now has additional deposits. To the extent it doesn't want to recycle them (in the past, it may have used them to buy Greek government bonds), it deposits them with a NCB (national central bank) - in this case the Bundesbank (Germany's Central Bank). Target claims are created because the Greek bank that loses deposits gets funding via the ECB's ELA (Emergency Liquidity Assistance) program. That table refers to EFSF commitments, so the important column is percentages. 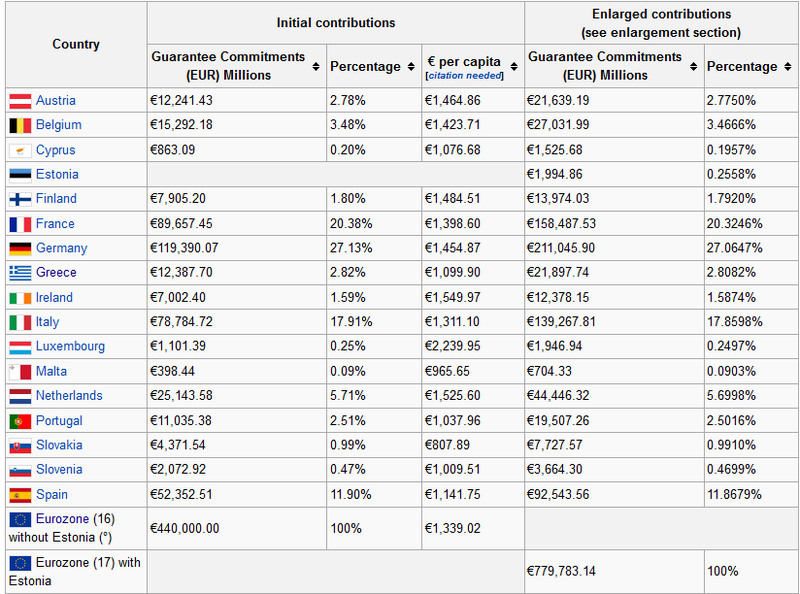 Percentages apply to the ESM as well as each country's commitment should there be a default. All the percentages change should a country default. Your explanation is correct. In the context of a default, however, Thomas is also correct about 'giving away goods for free'. For example: Spain imports German goods, but no Spanish goods or capital have been acquired by any private party in Germany in return. The only thing that has been 'acquired' is an IOU issued by the Spanish commercial bank to the Bank of Spain in return for funding the payment. The key sentence is the last one. "The existence of ELA undermines the monetary union."